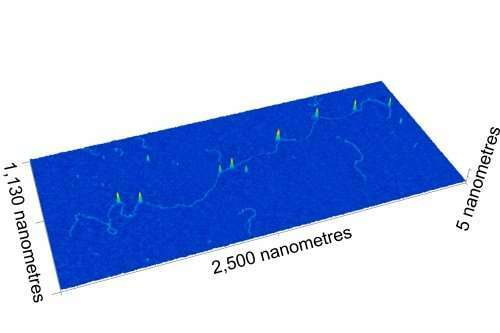 A team of scientists working at the University of Bristol have developed a new nanomapping microscope - powered by the laser and optics found in a typical DVD player. The new technology is being used to transform the way disease-causing genetic mutations are diagnosed and discovered. This microscope maps hundreds of chemically barcoded DNA molecules every second in a technique developed in collaboration with a team of US scientists led by Professor Jason Reed at Virginia Commonwealth University. Professor Reed's team uses CRISPR-Cas9 to label the molecules so that they can be mapped almost as accurately as DNA sequencing, while also processing large sections of the genome at a much faster rate. Using off-the-shelf DVD components, the Bristol team supercharged their atomic force microscope (AFM) to enable it to physically map the lengths of individual DNA molecules to a resolution of tens of base pairs at rates of hundreds per second. This unprecedented speed increase enables this DNA barcoding method to be used for real-world diagnostics for the first time. IBM scientists made headlines in 1989 when they developed AFM technology and used a related technique to rearrange molecules at the atomic level to spell out 'IBM'. AFM achieves this level of detail by using a microscopic stylus—similar to a needle on a record player— that barely makes contact with the surface of the material being studied. The interaction between the stylus and the molecules creates the image. However, traditional AFM is too slow for medical applications and so it is primarily used by engineers in materials science. The microscope measures single DNA molecules with sub-atomic resolution while creating images up to a million base pairs in size. And it does it using a fraction of the amount of specimen required for DNA sequencing, dramatically reducing the measurement time. Dr Oliver Payton from the University of Bristol's School of Physics, co-invented the nanomapping microscope. He said: "Using the laser focussing mechanism found in every DVD player we have built a microscope that has the resolution and speed to measure every molecule on the sample surface in 3-D.
"Although other types of microscope have the resolution to see these DNA molecules they are thousands of times slower and it would take years to make a confident diagnosis. "Not only is our microscope perfect for these medical applications, but because of the readily-available DVD player components it can be mass-produced." CRISPR has made a lot of headlines recently in regard to gene editing. CRISPR is an enzyme that scientists have been able to 'program' using targeting ribonucleic acid (RNA) in order to cut DNA at precise locations that the cell then repairs on its own. The ingenious chemical barcoding method developed by Professor Reed's team alters the chemical reaction conditions of the CRISPR enzyme so that it only sticks to the DNA and does not actually cut it. He said: "Because the CRISPR enzyme is a protein that's physically bigger than the DNA molecule, it's perfect for this barcoding application. "We were amazed to discover this method is nearly 90 percent efficient at bonding to the DNA molecules. And because it's easy to see the CRISPR proteins, you can spot genetic mutations among the patterns in DNA." To demonstrate the technique's effectiveness, researchers mapped genetic translocations present in lymph node biopsies of lymphoma patients. Translocations occur when one section of the DNA gets copied and pasted to the wrong place in the genome. They are especially prevalent in blood cancers such as lymphoma but occur in other cancers as well.